WAFFLES: Uh, Mrs. Katie? Are you going to eat that? KATIE: MRS. Katie??? For the record, you should address me as Boss. WAFFLES: Address??? You mean like on an envelope? But Mrs. Katie, what if I don't know how to write yet? KATIE: No Waffles. You're supposed to call me Boss. WAFFLES: But I don't know your number. How can I call you if I don't have your number? KATIE: And so it begins. WAFFLES: Sheesh. This Townhouse place is confusing. I have to learn how to write, I'm going to need my own phone, I don't even have my allowance yet. Earlier this week we asked if in addition to the funny dialogue between Katie & Waffles, you would enjoy hearing a little bit about the real stories behind our photos. Thank you so much to everyone who answered our survey... the results are IN! Would you like to know the real stories behind our photos? 2% No, just stick to the funny dialogue. Everyone who wrote in their own answer wanted both so we put those results into the Yes, please category. So it looks like we're going to try and share a little something-something with you each day about our photos, huh? We think this will be really fun. Sometimes the circumstances surrounding the photos are what inspires the dialogue and conversations we write. On the flip side, sometimes something just happens during the day that's so funny we want to tell you about it but we don't have any pictures... that's when we hunt through our archives to find photos that might match that story we want to tell. But no matter what we write, no matter how crazy (ex: Waffles) , there's always a thread of truth that runs through it. Both of these were taken on December 12, 2012. Oh, WOW! That's 12-12-12! ...just a little over two weeks after Waffles joined our family and only a few days after he was sprung from the kitten quarantine room. Waffles followed Katie EVERYWHERE. ... ok, he still does. And her food dish has always been of great interest to him. So much so that ever since this photo, Waffles dines on top of a cat tree by the big windows. This gives Katie a safe distance from the food thief and a fighting chance at her food while distracting Waffles from the temptation. My human has to watch all three of us to make sure we stick to our own meals. She's like the guardian of the food dish or something! Mommy guards us too when she serves treats & wet food! Li'l Waffles is too cute! We're all pretty good at eating out of our own bowls. AFTER everyone is finished, Raz will clean up the leftovers but never before the girls have left their bowls. We (in theory) eat in separate rooms to prevent that kind of vulture-like food activity. But you were a really CUTE vulture, Waffles. We usually eat out of our own bowls, though if there's any leavin's, then we'll switch bowls. You never know if the other cat is gonna get something better. Such a cute baby Waffles. I like reading about the back stories. Yay! We voted to hear the stories behind the photos, so we are glad a lot of other people wanted to hear them, too! Waffles did eventually learn to call Katie Boss, hehe. 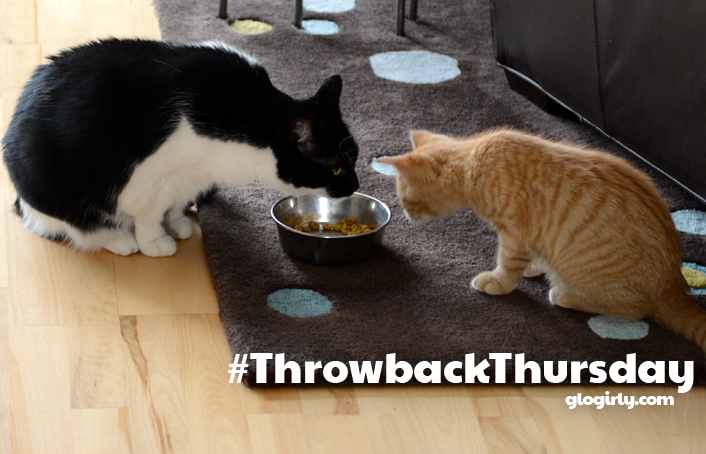 When Carmine was a kitten, he followed Milita everywhere, too, and it really annoyed her. These days, he likes being in the same room as her or near her, but he doesn't follow her the way he used to. M here: My daughter has two cats and one is picker. While the other eats everything in sight. The minute the picker leaves, the other cat help's himself to the crumbs left. You do such a great job with pictures and it is easy to see you do spend time getting just the right picture for the situation. I enjoyed the back story. They are both such cute kitties. We remember Katie complaining about Waff following her all over the place! Poor Katie. Poor Waffles. There is no winning, is there? Waffles, your sputtering as you walked away had us MOL!!! Hehehe! Loved the story behind the photos...I can't believe how SMALL Waffles was! I remember when you got him but he looks soooooo young!!! Sometimes when I do a post and don't have photos, I go back to past photos too...I think I learned that from you! It's brilliant! We all eats together but have our own bowls But if anyone dares walk away leaving any stinky goodness behind, it is fair game! The back story made me think of my own four-pawed food thief. 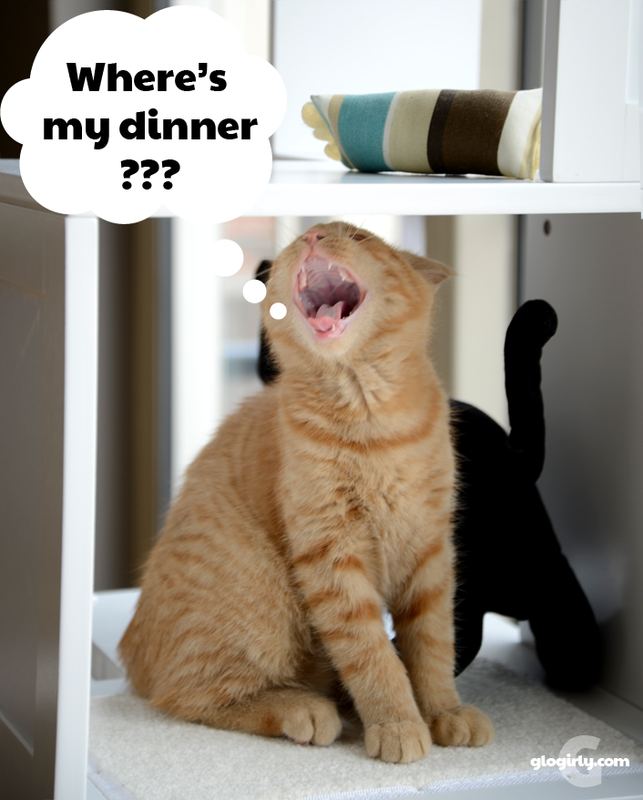 I have to feed my two cats separately, because Sam has a bottomless stomach and ever seeks to fill it. To ensure he doesn't pull a Hoover on Maya's bowl--she likes to eat in installments--I have to feed her in another room with a latching door and put her bowl up on the kitchen counter, covered, when she's done with Installment #1. Ditto in the afternoon when they get their second meal of the day. Waffles gets to eat on the cat tree? Sheesh, I only get the kitch-hen floor. 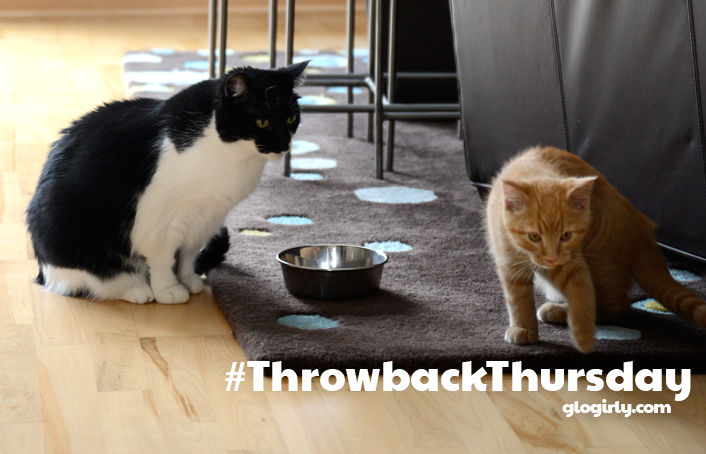 We remember when Waffles first arrived! And all the territory defining around food. The cat tree was a good call, Glogirly! Waffles dines in the upstairs portion of the cafe. Ah, those were the days! Yay!!! We get more cuteness and fun! !